AYANAH MOOR is a conceptual artist whose creative tools include printmedia, performance, drawing and video. Moor’s work has been addressed in books, Troubling Vision: Performance, Visuality and Blackness, and What is Contemporary Art? published by the University of Chicago Press. Recent exhibition venues include: Arts Incubator, The University of Chicago, (2015); The Studio Museum in Harlem, NY (2014); The Mattress Factory Art Museum (2012) and The Andy Warhol Museum in Pittsburgh; Welch Galleries, Georgia State University, Atlanta (2013); Subliminal Projects Gallery, Echo Park, CA; Te Tuhi Centre for the Arts, Auckland, New Zealand (2012); and Forja ArteContemporaneo, Valencia, Spain (2009). She has been awarded artist residencies at Proyecto ‘Ace in Buenos Aires, Argentina (2011); Auckland Print Studio in New Zealand (2010); Women’s Studio Workshop and Blue Mountain Center in upstate New York; Vermont Studio Center (2006) and Atlantic Center for the Arts, New Smyrna Beach, Florida (2001). Moor completed her BFA at Virginia Commonwealth University and MFA at Tyler School of Art. Moor is currently a jackman goldwasser studio resident at the hyde park art center (2015-2016). Upcoming residencies include the center for book, paper & print, columbia college, chicago (2015-16), and the auckland print studio, auckland, new zealand (january 2016). Ayanah Moor is associate professor in the department of printmedia at The School of the Art Institute of Chicago. born in Louisville, Kentucky, JAMILA RAEGAN’s creative practice was formed at an early age by her father, a criminal defense attorney, and motherA visual artist. Raegan’s engagement with the arts and social justice has taken many forms. She studied photography and Pan‐African Studies at the University of Louisville. Her vocal work led to national and international tours with groups such as Kindred The Family Soul, Platinum Pied Pipers, and collaborations with The Pearl Dance Collective in Brooklyn. She served as founding board member and arts educator at Extreme Kids and Crew, a not‐for‐profit arts organization for children and families with special needs in New York City. 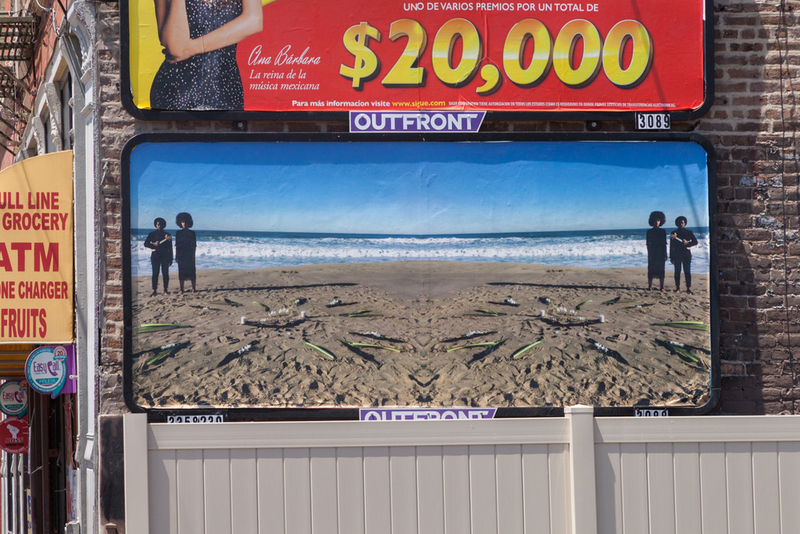 Raegan’s most recent project with her wife Ayanah Moor features site‐specific vocal and musical performances in memorial to victims of police violence, entitled Offerings. Her notable afro is also beautifully captured in Michael July’s photo-graphy book, Afros‐A Celebration of Natural Hair. KRISTA FRANKLIN is the recipient of the Propeller Fund and the Albert P. Weisman Award, and has held residencies at A Studio in the Woods, CaveCanem, and the University of Chicago’s Arts + Public Life Initiative. Her poems and visual art have been published in Black Camera, Copper Nickel, Callaloo, Vinyl,, BOMB Magazine and Encyclopedia, Vol. F‐K. Willow Books published Study of Love & Black Body. her chapbook of poems, In 2012. Franklin’s work has BEEN exhibited nationally, and was featured on 20th Century Fox’s Empire (Season Two). She is the co‐curator of the Chicago citywide poetry and art initiative, EKPHEST: A Festival of Art + Word, and 2nd Sun Salon, a community meeting space for writers, visual and performance artists, musicians and scholars. She holds an MFA In Interdisciplinary Arts –Book & Paper from ColumbiA College Chicago. ANTHONY WILLIAMS, a Chicago native, is a Pittsburgh based dancer, choreographer, and educator. He has a strong investment in his community,and his work is a reflection of who he is as a community member, artist, and an advocate for social justice. Anthony’s ongoing commitment lies in the empowerment of the oppressed and facilitating the discovery of self through art making and process. As a full time dancer with Attack Theater (Pgh). he is excited by the possibilities of movement as a tool to unlock play, power, and potential. Anthony has performed with Congo Square Theater Company (Chicago), Staycee Pearl dance project (Pgh), Texture Contemporary Ballet (Pgh) August Wilson Center Dance Ensemble (Pgh), and Deeply Rooted Dance Theater (Chicago). As a choreographer, he has created original works for the infra dance company at Carnegie Mellon University, Point Park University, Reed Dance, Hope Academy, and Dreams of Hope. He is an advocate for queer youth and hasactively participated as well as performed for Pittsburgh’s Pride Festival in 2014 and 2015. In 2015 and 2013, Anthony premiered work at KellY Strayhorn Theater’s newMoves Contemporary Dance Festival. In 2014, he was selected as a Kelly Strayhorn Theater Fresh Works Residency artist for the development of Loving Black, which was supported by The Heinz Endowments, Pittsburgh Foundation, and Greater Pittsburgh Arts Council. In 2015, Loving Black premiered as part of the Community Supported Art (CSA) program at the New Hazlett Theater. Anthony was recently recognized with The New Pittsburgh Courier’s 2016 Fab 40 award.